On May 25, 1945, Second Lieutenant Tsunenobu Nakahara took off from Chiran Army Air Base as a member of the 52nd Shinbu Special Attack Squadron and died in a special attack west of Okinawa at the age of 22. He piloted an Army Hayabusa Type 1 Fighter (Allied code name of Oscar). After his death in a special attack, he received a promotion to Captain. He was from Tokushima Prefecture and graduated from the Imperial Japanese Army Air Academy in the 57th Class. Recently there has been no break day after day, and I apologize for not having written a letter. After receiving the order (March 30), I ask that you please forgive me because the few days have been extremely busy. As I already have notified you, it has come about that I also finally will go to battle as the leader of an honored Shinbu Squadron. I deeply thank you that there would have been nothing without all of your help. I believe that dying bravely like a cherry blossom is the greatest honor for a military man. Nothing else surpasses this as my long-cherished desire. I think that you also will be glad and will celebrate my first battle. I was born in the Empire, and I cannot wait to say that I will repay the Empire with my death. Please rest assured that I am determined to carry this out gladly. I did not repay your kindness since my birth. Even though you regret my death, through this I ask that you please forgive my lack of filial piety until now. When I reminisce, I had a long life without any inconveniences, and today I truly, truly appreciate your kindness. I have no regrets before death. I just will rush headlong with a crash dive aimed at an enemy ship. Please rest assured since I am determined to fall smiling with gladness. I expect that my remaining articles are going to be sent from Hitachi Flight Group. Also, I sent clothes from Kagoshima. I will bring my short sword. As for contact, you can receive them from either Second Lieutenant Maeshima or Second Lieutenant Fujiyama of the Hitachi Flight Group Hokota Unit. I thought that you might come to visit at Hōfu, but I stopped when I realized that it would be useless if you came after I already had left. I do not know yet when I will make an attack. I will notify you in the end. Absolutely please do not visit. Please give my regards to Kawano-sensei and our relatives. Finally today it has come about that I will make a sortie to the OO  area as the squadron leader. I have no regrets. The only regret is that for a long time I did not show filial piety to you, caused you only worries, and was not able to repay your kindness at all. Please forgive me. Finally, I pray for your health, and from OO I pray that you will have a long life. While I shout long live His Majesty the Emperor, smiling I will make a sortie. The letters come from Chiran Kōjo Nadeshiko Kai (1996, 73-6). 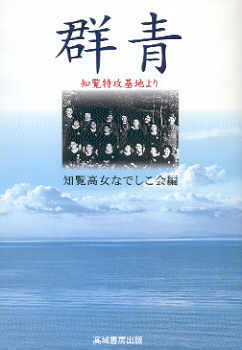 The biographical information in the first paragraph comes from Chiran Kōjo Nadeshiko Kai (1996, 73), Chiran Tokkō Irei Kenshō Kai (2005, 204), and Osuo (2005, 198). 1. OO indicates information that was a military secret and could not be included in the letter.